As the number of water parks attached to hotels continues to grow, Hotels.com has released its picks for the top hotel water park for different age groups. Among them: The Schlitterbahn Beach Resort on South Padre Island, Texas, is best for children ages 2-6, according to Hotels.com. It’s a beach and water park combination with indoor and outdoor attractions, including four water coasters, two five-story slides, tidal wave rivers, a sandcastle, and an indoor Carousel and gaming area. For children ages 6-12, Hotels.com likes the Great Wolf Lodge in Wisconsin Dells, Wis. This hotel’s park has features a tree house, water cannons, a children’s spa and three pools. The Hope Lake Lodge and Indoor Water Park in Cortland, N.Y., is the top choice for teens. The park boasts more than 150,000 gallons of water and over 500 feet of winding slides in a mountain setting. Among the rides are tube slides and a wave pool. Other nearby activities include sand volleyball, ziplining, mountain biking, boating, hiking, fishing and golf. 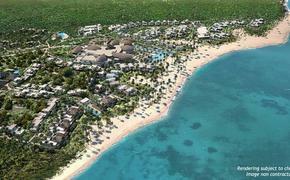 For adults, Hotels.com likes the Grand Bahia Principe Jamaica–Runaway Bay. This all-inclusive resort has three outdoor pools connected by a lazy river, as well as a swim-up bar. There’s also a private beach offering kayaking, snorkeling and windsurfing. The resort is close to Jamaican aquatic attractions such as the Green Grotto caves, Dunn's River Falls and Dolphin Cove.